RetroBear loves his handhelds so what better way to further enhance those gaming memories by having a look at some easy to obtain and easy to use Plug N Play devices. They’re a darn sight cheaper than a 3DS that’s for sure…..
As you’ll know from my scribblings here at RetroSection I am what you would class as a retro traditionalist. That is I don’t like anyone messing around with how things were. I don’t have anything against the silver version of the Atari 2600, I just prefer the original woody model. I love the Gameboy Pocket but I also like the chunky feel of the grey, 4 AA battery original. So it is with interest that over the last few weeks I have been tentatively dipping my retro toe into the world of Plug N Play. Why, aside from the fact they were cheap at the car boots ? Well, while the cat may wish to hide from curiosity, I’d much rather go and kick it in the shins and take my chances. I should hate myself for playing these types of devices, which plug into the back of your TV set and run off batteries. You get a retro styled arcade stick and a couple of fire buttons and that’s it. You can’t get more basic and simplified than that. 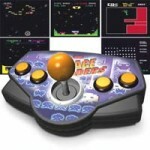 Space Invaders from Taito – Oh how the word Taito brings back so many memories of great coin-ops of the past. This though is the granddaddy of them all – the original and still the best version of Space Invaders. But wait – you also get Qix, Lunar Rescue, Phoenix and Colony 7 on the same console ! 5 retro arcade classics at the touch of a button. Man, Galaxian, Dig Dug, Rally X and Bosconian. I’ll admit to not having played the last one but the first 4 took me back to a bygone era. Namco were really the Kings of Arcade back in the early days and it doesn’t get much better than this. 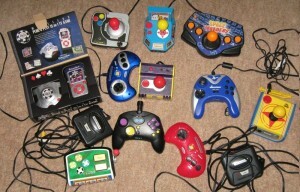 Namco Plug N Play 2 – What’s this ? Perhaps this was aimed at female gamers as it contains Ms Pac Man, along with Pole Position, Galaga, Xevious and Mappy. Again I’ll admit to knowing bugger all about the last title but I have spent quite a long time getting to grips with Pole Position again. As I said it doesn’t end there – there are lots of different Plug N Play devices out there catering for pretty much every taste. There is even a Namco Pac Man-only version, with 4 different varieties of the game and a Pac Man styled joystick. All the games are as they were in looks sound but most important of all, in playability. 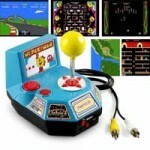 Hunt these down, plug them in and take yourself back to a more fun, warm and fuzzy time…..
Print article This entry was posted by RetroBear on July 29, 2011 at 9:15 pm, and is filed under Everything Else, Retro Reviews, Uncategorized. Follow any responses to this post through RSS 2.0. Both comments and pings are currently closed. RetroComment : GAME saved, but what now to prevent GAME over ? about 7 years ago - Comments Off on RetroComment : GAME saved, but what now to prevent GAME over ?